That, one, Wright was known to make misleading and self-serving statements during his entire career, which will be discussed throughout this article. Secondly, Sullivan’s geometric experimentation and specific design process were key components of the Charnley design, whereas Wright’s early output did not exhibit anything remotely close to Charnley’s ingenuity. If one is to believe Wright at least contributed certain elements to the Charnley House then the argument can also be made for another one of Sullivan’s employees at the time, Irving Gill. Furthermore, Sullivan’s relationship with the Charnleys themselves cannot be dismissed; their similar temperaments and closeness suggest Sullivan had some influence over its design. This was not just a residential commission for some random client. And finally, the home’s motifs, exterior, and manipulation of space are all trademarks of Sullivan’s work. Although Wright might have considered himself a fully developed individualist at birth, it was Sullivan who truly shaped him. During his time working for Sullivan, the young and relatively inexperienced Wright blossomed into the modernist he’d be known as for the rest of his life. 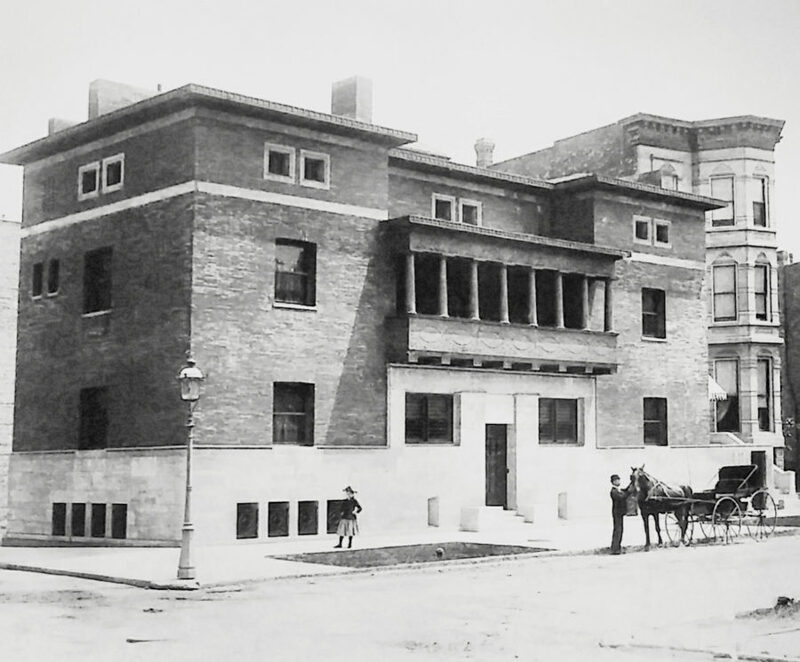 The Charnley House, whether a collaborative design or not, served as a model for Wright’s earliest work as an independent architect, specifically the Winslow House, built in 1894, which shares many similarities with Charnley. Even though the architects had a falling out when Sullivan fired Wright in 1893 (Wright once again bended the truth by claiming he quit), the men reunited near the end of Sullivan’s life. Wright sometimes downplayed Sullivan’s overall influence, but one cannot deny the importance Sullivan had on Wright’s design philosophy. There would be no Wright without Sullivan. A great deal has been written about the influence of Frank Lloyd Wright on modern architecture, but what exactly inspired the architect? Wright rarely acknowledged any direct influences, because after all he was a creative genius at birth, right? But kidding aside, most architectural historians agree there were five critical factors in the shaping of his architectural philosophy: nature, music, the geometry of Froebel blocks, Japanese art and architecture, and the work of Louis Sullivan. 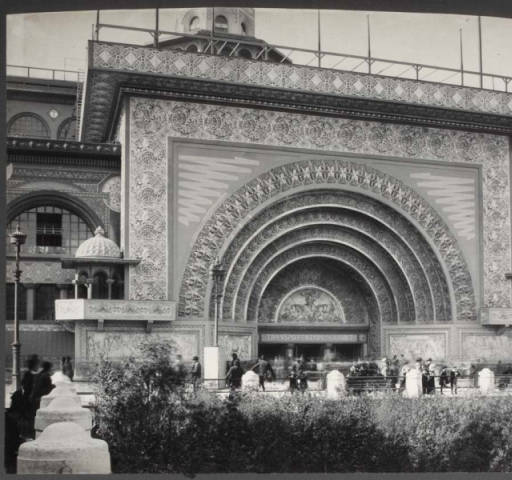 Dismissive of others, even whose work he downright copied, like Joseph Olbrich’s Exhibit Hall (1897) in Vienna, Sullivan was the only architect Wright ever acknowledged during his lifetime. Wright referred to Sullivan as Lieber Meister (a German word meaning “Beloved Master”). One cannot disregard the importance of these influences on Wright; they were so necessary that if one was missing from the equation, his life might have turned out a bit differently. Would he still have become “the world’s most famous architect” if he had not been introduced to both Japanese art and Sullivan’s ideology? 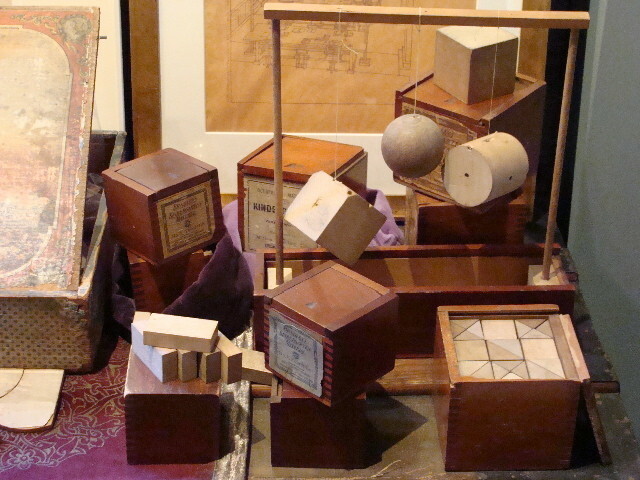 He wrote in An Autobiography that he could still feel the shapes of the smooth wooden maple Froebel blocks (the cube, sphere, and triangle) but what would have happened if he had also not been exposed to its geometry? Not every person who played with Froebel blocks as a child and studied nature and collected Japanese art prints and listened to music grew up to become an architect, let alone a great one, but the same cannot be said for the people who worked in Sullivan’s sphere. Architecture is a collaborative process, where people draw ideas from the work of others, especially from the people in charge. Wright was not an exception to this rule. 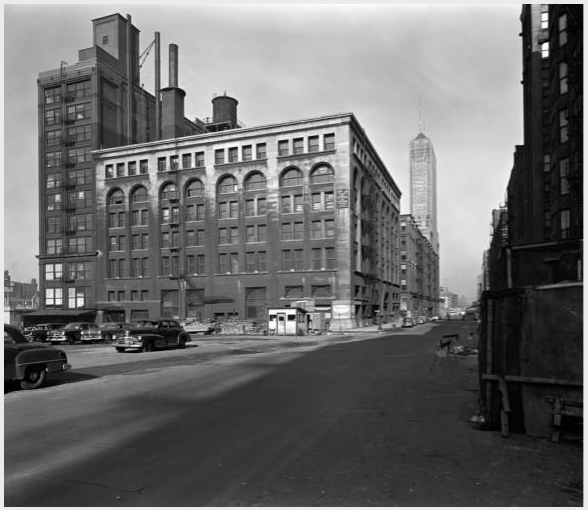 A number of architects who worked under Louis Sullivan, including Irving Gill, George Elmslie, Richard E. Schmidt, and Parker N. Berry, all went on to create avant-garde structures during their own independent careers. Like Wright, they created a new type of architecture completely or nearly free of historical precedent. Now venerated as the “father of modernism,” Sullivan was instrumental in the overall development of all these men (and women like Marion Mahony, Wright’s later assistant, who credited Sullivan as the main force behind Wright’s Prairie School style in her book The Magic of America). Although Sullivan’s impact on Wright has been dismissed by some in the past (and even to this day), this is simply not the case. Most likely historians, such as Lewis Mumford, took Wright at his word. In a letter from 1930, six years after Sullivan’s death, Wright wrote to Mumford “though pupil, I think I was never his disciple. Sullivan is on record as gratefully acknowledging this.” Wright’s declaration contradicts the actual evidence. 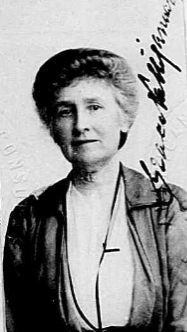 Just like the others who worked under Sullivan, Wright was a disciple. As Wright moved away from his first employer Joseph Silsbee’s historic-influenced Shingle Style, he refined Sullivan’s philosophy as his own, creating a purely American form of architecture, later known as Prairie Style. 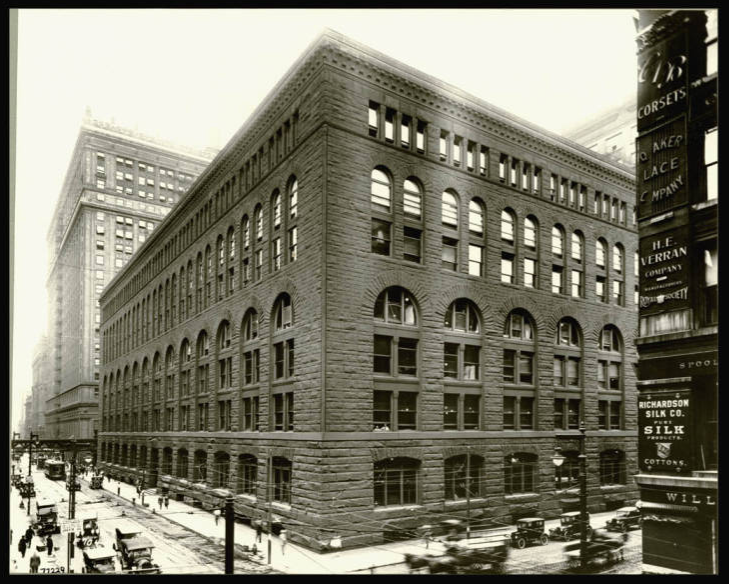 Before the Charnley House, Louis Sullivan had been experimenting with the geometric simplification of surface and mass for a three-year period between 1887-1890, which was sparked by the design for Chicago’s Marshall Field Wholesale Store (1885-87). 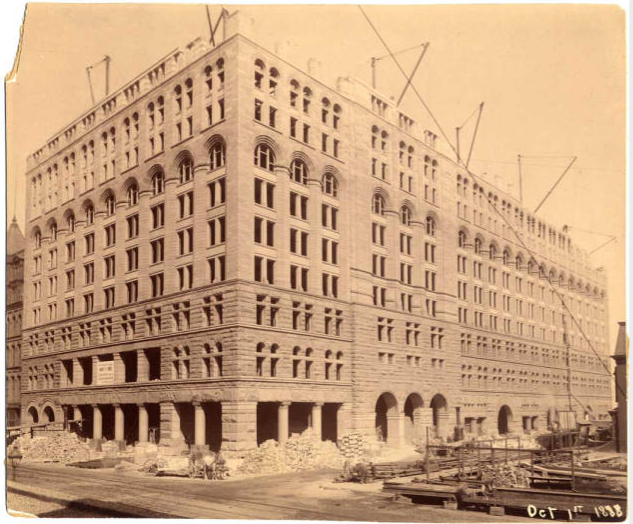 Considered one of the most important commercial structures of the nineteenth century, Sullivan described it as “massive, dignified, simple…a monument to trade.” The building’s architect, H.H. Richardson, had a huge impact on Sullivan, who began creating his own interpretations of Richardson’s work, borrowing the basic geometric clarity of Richardsonian Romanesque architecture but taking it to a whole new level. Sullivan’s now demolished Walker Warehouse (1888) and Auditorium Building (1889) both clearly reference Richardson’s Wholesale Store. Walker’s design was especially noteworthy in its display of total abstraction. 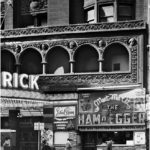 Wright wrote in Genius and the Mobocracy, an intimate account of his personal and aesthetic relationship with Sullivan, that the architect said the building was “the last word in Romanesque” with its smooth ashlar masonry and exclusion of heavy texture around the arches. The Auditorium Building, where Sullivan moved his architectural firm into the top floor of the tower, originally had a different design in the works. But after seeing the Wholesale Store, Sullivan instead simplified the building’s elements to mass, texture, and proportions. Sullivan’s artistic redevelopment first began in 1887 when the architect designed a tomb in Graceland Cemetery for the father of the richest man in Chicago, businessman Martin Ryerson. 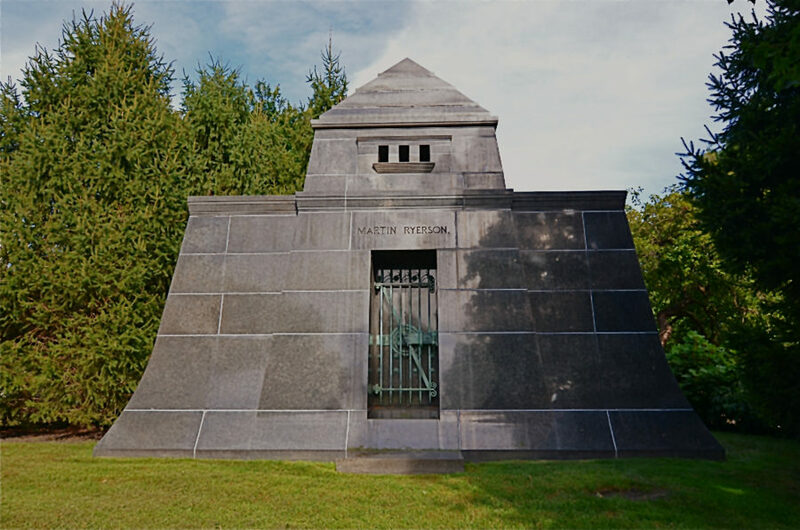 Though Egyptian-influenced, the highly polished granite monument is composed entirely of elementary geometric masses without a single piece ornamentation (except for the mausoleum gate). Designed before Wright was hired by the firm, the monument was the first example of Sullivan’s evolutionary process of creating cubist-like structures, which continued with the designs for the Falkenau Rowhouses (1888) and the Kehilath Anshe Ma’ariv Synagogue (1890), and ultimately culminated in the design for the Charnley House (1891). Written the year after Charnley was conceived, Sullivan’s words were a reflection of his work during 1887-1890 when he incorporated elements of Richardson’s work and created something original. In order to produce a completely new form of architecture, he had to eliminate most decorative elements and focus only on surface and mass. He eventually began to overlay his buildings with ornament, but time and time again he would return to his experimental stage, as seen in later buildings like Harold C. Bradley House (1909) in Madison, Wisconsin and the Van Allen Building (1913) in Clinton, Iowa. 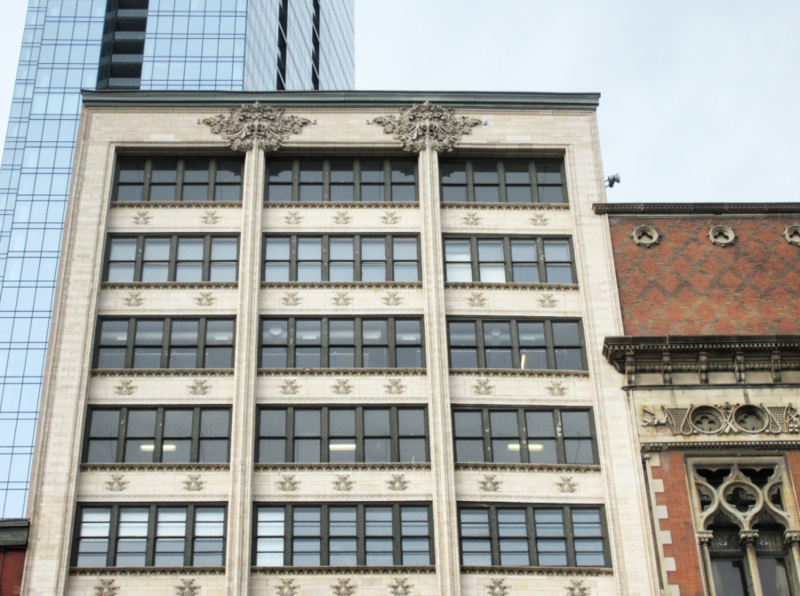 Even the facade Sullivan designed for the Gage Group Buildings in 1898 is understated, although still expressive, with its emphasis on the structure itself. There is little evidence in the early part of Wright’s career to suggest anything as remotely mature or ground-breaking as Sullivan’s output between 1887-1890. Wright’s work only changed after he started to work for Sullivan. 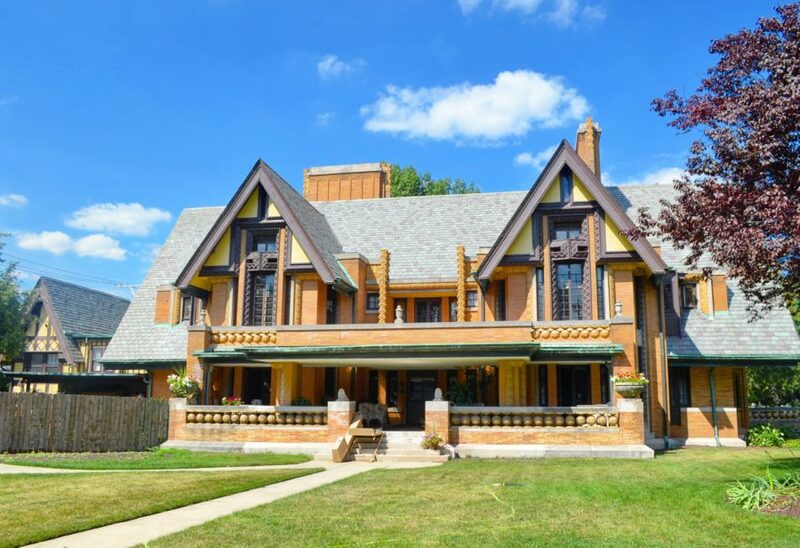 Instead Wright was much more influenced by his first employer, Joseph Lyman Silsbee, which is evident in Wright’s own Shingle-styled home in Oak Park, built in 1889 from money actually borrowed from his second employer, Louis Sullivan. Wright’s design also owes a lot to another architect, one who conveniently lived just two miles away in the neighboring town of Austin, which would not be annexed into Chicago until 1899. In 1888, a year before Wright created his own home, Frederick Schock designed a residence for his mother next to one he built for himself. 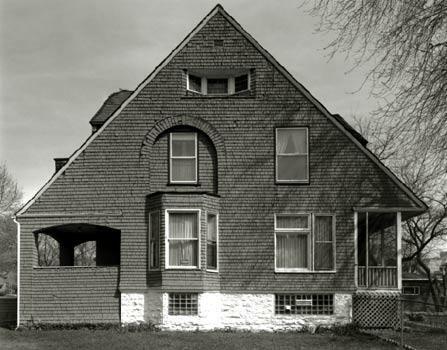 Both his mother’s house and Wright’s house are strikingly similar in their combination of a dramatic gable with shingle surfaces and minimal trim. Schock had actually published the design in Building Budget as “A Cheap Suburban Residence.” Had Wright seen that architectural magazine? Or had he gone by Schock’s mother’s house while riding his horse one day? How could he not have seen it in the open prairie landscape of late 19th century Oak Park/Austin? Whatever the case, Wright clearly “copied” another architect’s work making it difficult to believe he was as original as he claimed. 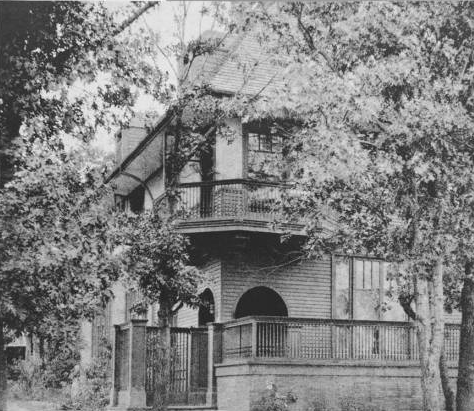 Silsbee’s influence, and not Sullivan’s, is also found in the number of “bootleg” residences Wright designed independently while working for Adler & Sullivan. If Wright solely designed Charnley as he claimed, it came without warning or precedent. Examining his architectural output between 1888-1893, the years he worked for Sullivan, there are very few visual references to Charnley. Wright was still using a number of historical references in his work. 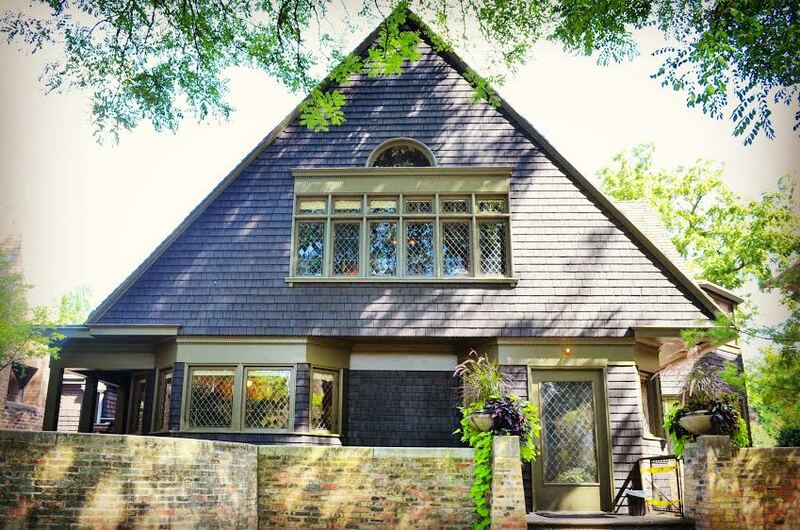 Although a bit geometric in shape, the Queen Anne style Robert Parker House (1892) in Oak Park with its turrets and dormers is still rather conventional-looking, especially when compared to Charnley, designed the previous year. The same can also be said of another “bootleg,” the George Blossom House (1892) in Chicago’s Kenwood neighborhood, which was designed in the Georgian Revival style. 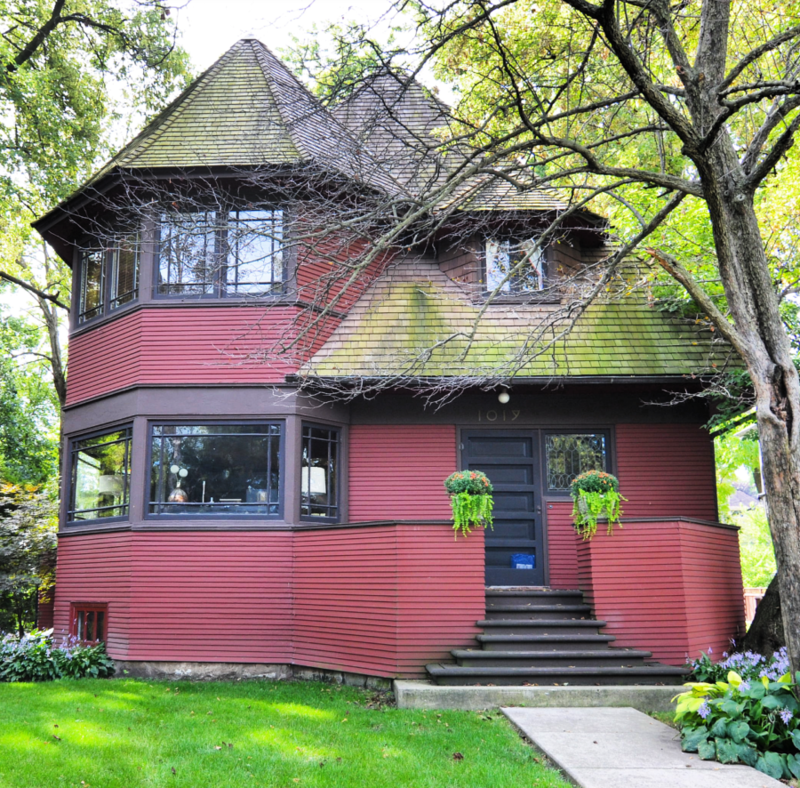 Wright continued to work in historical revival styles, even after “quitting” Sullivan, as seen in Oak Park’s Nathan Moore House (1895) and George W. Smith House (1898), clearly both a step backwards in the direction of Silsbee, who worked in a number of historical styles. How can the same architect have both designed the modern Charnley House and these revivalist structures? Moore, especially is a surprise, as it came four years after the Charnley design. Wright claimed he reverted to a traditional English half-timber design because that’s what the client wanted. He was supposedly apprehensive to accept the commission, but had a family to support. 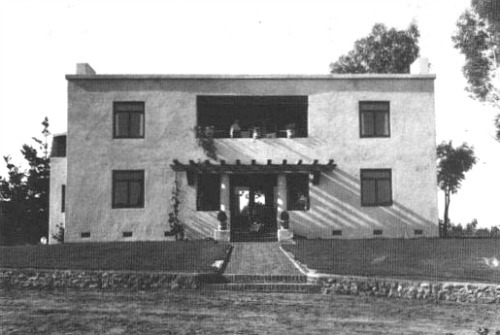 Yet why was it acceptable for the same clients to allow Wright to recreate it, after a devastating fire on Christmas Day 1922, in a more modern style reflective of his “Maya Revival architecture” period? 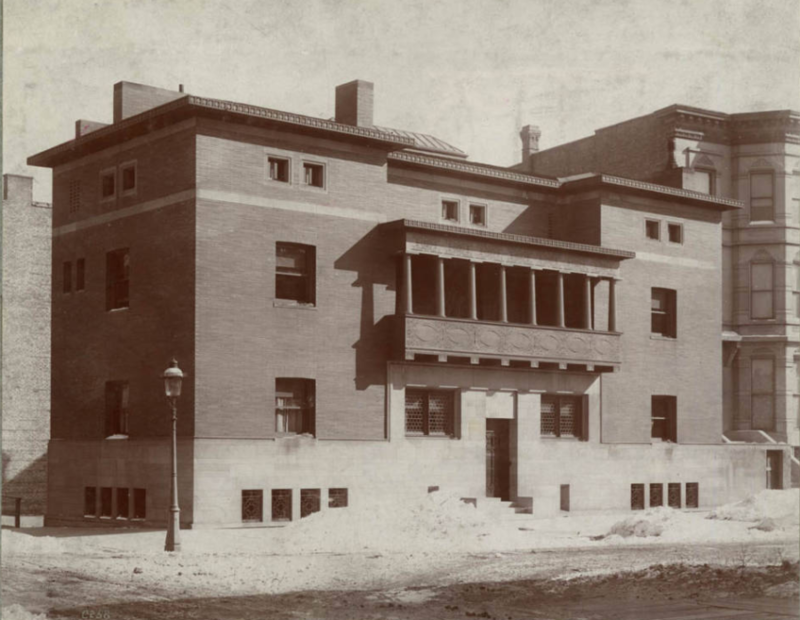 The new house resembled Wright’s Imperial Hotel, built around the same time. Suppposedly back in 1895 Moore was worried about “being laughed at” while taking the morning train, and did not want a modern house. But Moore hired a progressive architect, then rehired him to redesign what turned out to be a rather unconventional-looking home for its time. Could it be that Wright was not as progressive as he so claimed? Another unexpected structure is the shingle-styled George W. Smith House, which resembles Wright’s earlier bootlegs as well as his own home. Supposedly designed in 1895 (Wright was known to fudge dates throughout his career) and not built until 1898, the house sharply contrasts the style Wright was using at the time as he was just a couple of years away from the full maturation of his Prairie Style architecture. One again must ask this question: How could the same architect of this home also have designed Charnley? 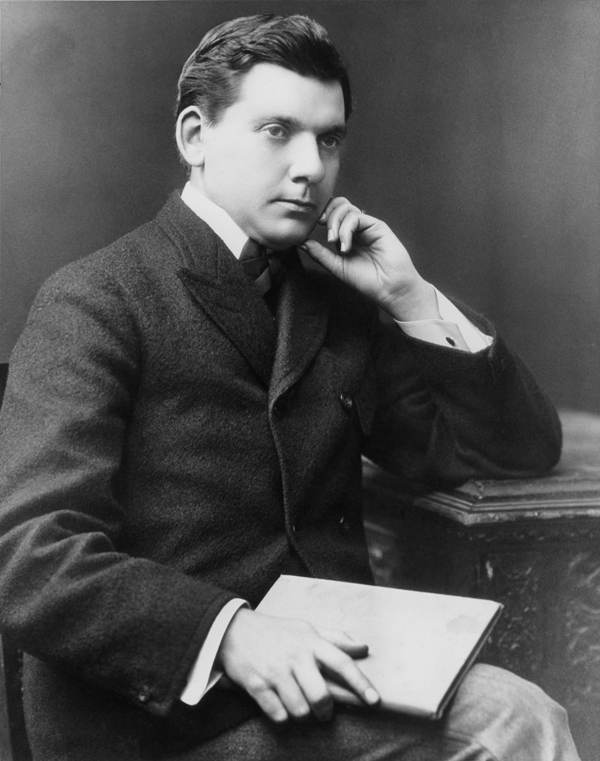 Historians like Grant Mason and Henry-Russell Hitchcock admitted that Wright’s early career was marked by “retrogression” and when examining the evidence it appears Wright did not actually influence his master. 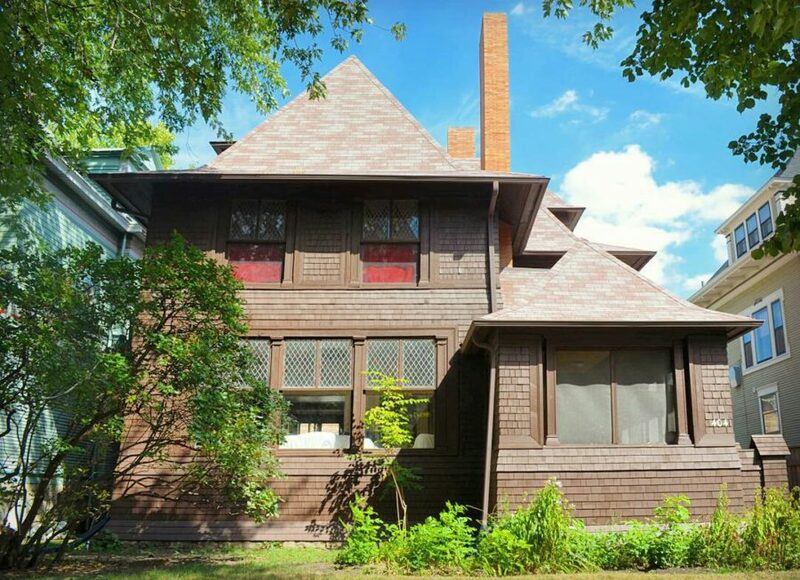 Although it must be noted that Wright’s Allison Harlan House (1891-92) was “a radically original work,” at least according to his biographer Brendan Gill. The influence of Charnley is apparent in its second floor balcony and gently sloping roof. The house marked the direction Wright would soon follow in his later residential work; in the 1950s he referred to it as “the beginning of my own practice.” Unfortunately the house was destroyed by a fire in 1963. But the William MacHarg House, built at the exact same time as Harlan, is a step backwards, again specifically in the direction of Silsbee’s Shingle style. All of Wright’s “bootlegs” created during or after the Charnley House, as well as a number of his independent commissions, hardly resemble its innovative design. 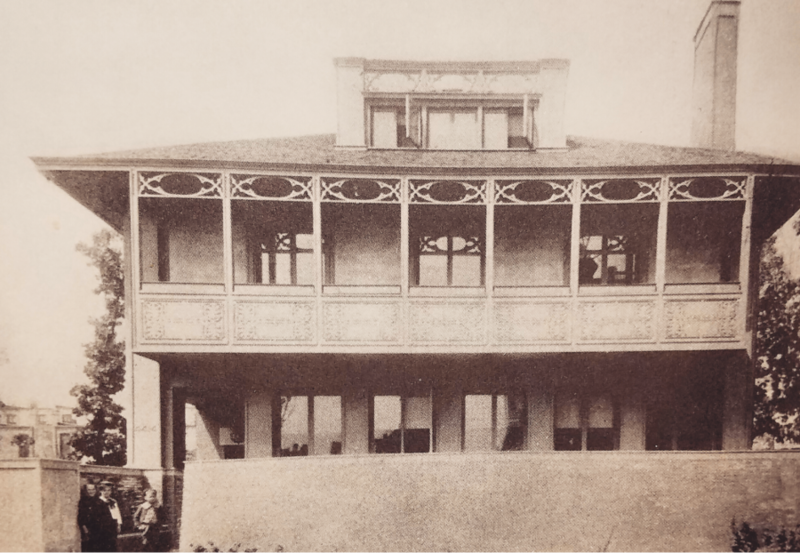 Like Sullivan, Wright had to find his own footing in the architectural world, which would materialize in the design of the Winslow House (1894), which will be discussed in the second part of this article, and other commissions of the late 19th century. This experimental period, again like that of his mentor Sullivan, would lead to Wright developing Prairie Style architecture. The Charnley House is an excellent example of how the facade reflects the underlying plan or the function of the building. 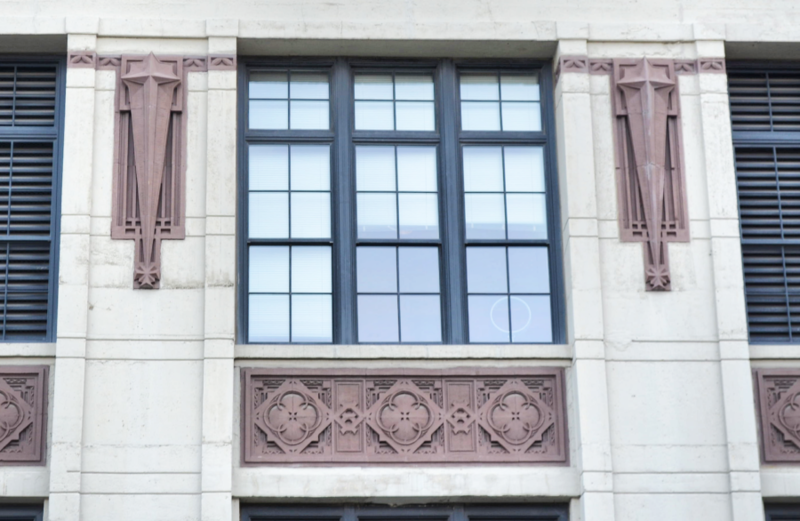 After all, the phrase “form follows function” has been famously attributed to Louis Sullivan. Sullivan always started with a plan first through equisse or the “initial sketch,” an idea Sullivan first learned at the Ecole de Beaux Arts in Paris, which helped to shape the home’s overall design. Although Sullivan wasn’t a Beaux Arts architect in the traditional sense, he took this idea and practiced it for the rest of his career. In The Autobiography of an Idea, written in 1924, Sullivan expounded on his philosophy in that “one hold to the original sketch in its essentials.” Instead of imitating historical styles, Sullivan attempted to create a new grammar of his own, not only through the concepts he learned at EBA (as well as at MIT) but also through the work of H.H. Richardson, which was discussed earlier. While people think of Beaux Arts as a style, which it is, it’s also important to remember it as a manner of training. Emphasis was not only placed on the superficial element of how it should appear but also its appropriateness and function; how the building works and what it should do. This explains why a number of Beaux Arts-trained architects had no problem jumping from style to style, whether it be Baroque or Neoclassical or Art Deco. The idea of expressing the functional character of a building is something Sullivan learned at EBA and applied to his organic architecture, which was then carried on by Wright. Sullivan would take an idea, which did not deviate too much from its original form, and hand it over to a draftsman, like Wright for example, who would translate Sullivan’s ideas but again would adhere to the “initial sketch” as closely possible. Wright would exaggerate the truth by turning this process of “translating” into “inventing”. Wright would apply a similar method almost half a century later when designing his most famous building. Although Wright had visited the site for Fallingwater several times during the previous year, he did not commit an actual design to paper, contradicting what he had written in letters to the client. When the client Edgar Kaufmann called one day from Milwaukee and said he was 140 miles away from Wright’s home at Taliesin, the architect enthusiastically said “Come along, E.J. We’re ready for you.” although there was not a thumbnail sketch, an elevation, plan, or even a single presentation drawing. After hanging up the phone, the nearly 70-year-old architect then sat down at a drafting table and proceeded to draw – non-stop – while apprentices continuously fed him sharpened pencils. The design was set to paper as quickly as he could draw. After Wright created a number of drawings in 90 minutes, he turned them over to two apprentices, Bob Mosher and Edgar Tafel, who took over from this initial design. Nothing was made out of thin air as Wright’s most famous work had lived as an “initial sketch” in his head for months before it was finally executed. This quick burst of creativity was a perfect example of what both Sullivan and Wright referred to as organic architecture. The differences between the design that day and the finished product are minimal at best. So how is this event any different than Sullivan’s practice of the “initial sketch”? Maybe the exact same thing happened during Charnley’s creation 45 years earlier? 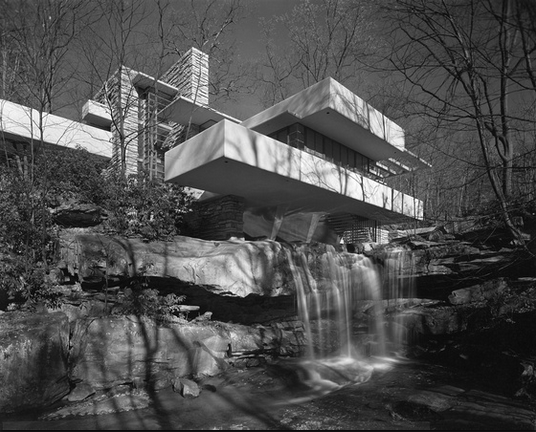 If architectural critics and historians consider Fallingwater to solely be a work of Wright’s, then can’t the same case be made for Sullivan and Charnley? These were rich words, considering Gill was directly involved with the Transportation Building, an important commission for Sullivan, who surely must have met him. Also, Gill and Wright were roughly the same age who followed the same exact path; both were students of Silsbee and Sullivan before starting their independent careers. And like Wright, Gill expounded upon the modernist principles he had first learned from Sullivan and practiced them throughout his career, specifically the idea that form should articulate function and buildings should be simplified into bold and expressive shapes. Wright was known for replicating Sullivan’s work, and Gill was no exception. 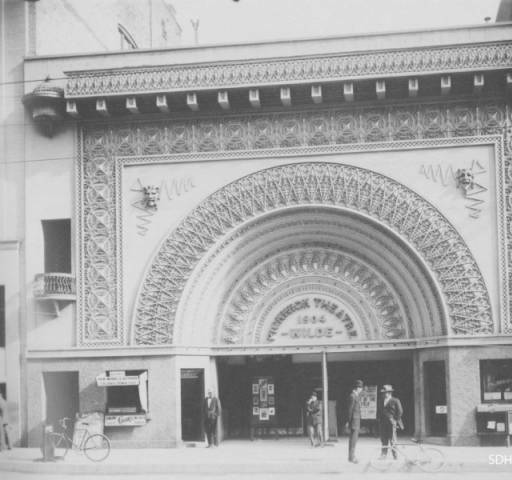 The facade of Gill’s now-demolished Pickwick Theatre in San Diego paid homage to Sullivan’s Transportation Building and its famous “Golden Door” from the 1893 Columbian Exposition. One cannot discuss the disputed authorship of the Charnley House without mentioning another example of Gill’s work that is reminiscent of Sullivan’s. The Russell C. Allen house (1907) in Bonita, California, may be the first intentionally anti-ornament structure ever built. 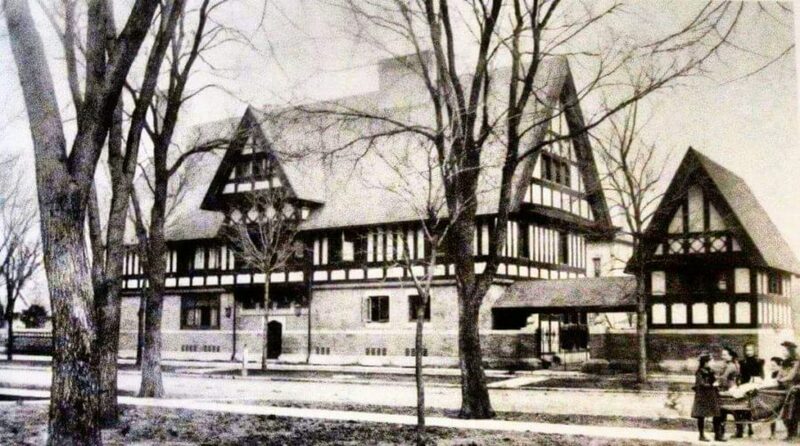 Although architect Adolf Loos is usually credited with designing the first stripped-down, anti-ornament residence with the Steiner house (1910) in Vienna, Gill’s Allen house was designed three years earlier and deserves recognition. Gill had a brief but important partnership with Frank Mead; the Allen House is one of their collaborations. As an apprentice for Sullivan at the time of the Charnley construction, one wonders how much of an impact Gill had on Charnley’s design (or how much Charnley influenced Gill)? On its own the Allen house is a remarkable landmark of early 20th century American architecture with its flat-roof, boxy shape, punched-in porches and windows, and cylinder columns. Built fifteen years earlier (and a year before Gill permanently left Chicago), Sullivan’s design for Charnley rejected the historical details common to Victorian architecture in favor of abstract form. The exterior is a virtually unadorned brick and limestone facade. If one takes away the balcony and the third story, the Charnley house looks remarkably similar to Gill and Mead’s Allen house. If one can make the case for Wright solely designing Charnley (or at least collaborating with Sullivan on it) then can’t the same be said for Gill, another one of Sullivan’s employees at the time of its creation? The fact that Gill’s joint effort with Mead, specifically the Allen House, shared a number of characteristics with Charnley cannot be ignored. Both Gill and Wright were pioneers of modern architecture. And both used Charnley as a jumping off point as they started their careers, stepping further into complete abstraction – Gill with the Allen House and Wright with the Winslow House, which will be discussed in the third part of this series. 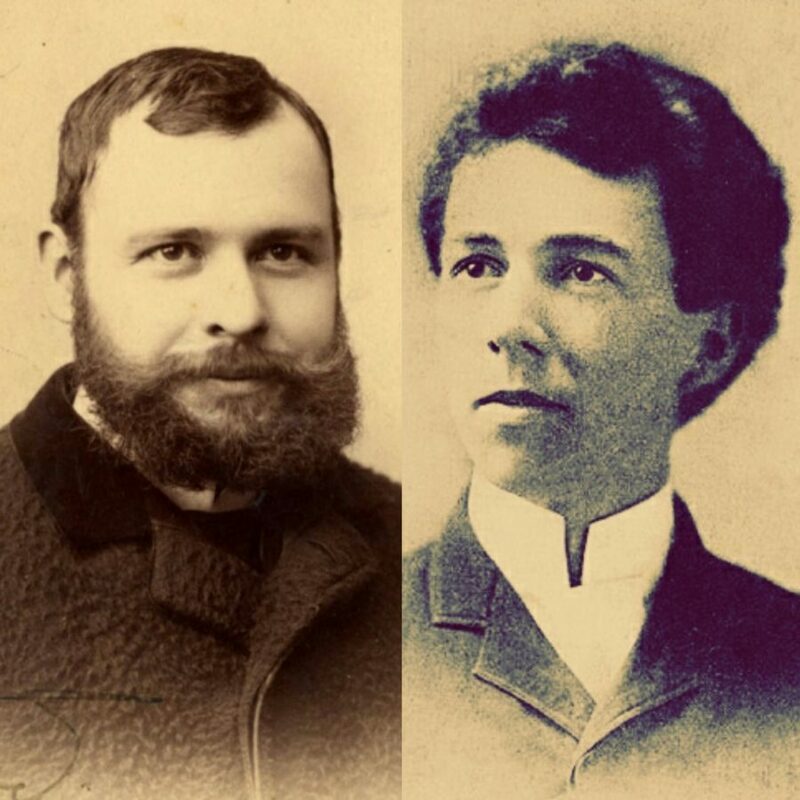 The next installment will further investigate Sullivan and Wright’s working relationship, along with the Gold Coast and the Charnley House itself. Hines, Thomas S. Architecture of the Sun: Los Angeles Modernism: 1900-1970. New York: Rizzoli, 2010. Howard, Hugh. Architecture’s Odd Couple: Frank Lloyd Wright and Philip Johnson. New York: Bloomsbury Press, 2016. O’Gorman, James F. Three American Architects. Chicago: University of Chicago Press, 1991. Pfeiffer, Bruce Brooks and Peter Goessel, ed. Frank Lloyd Wright: Complete Works, Vol. 1, 1885-1916. Taschen, 2011. Twombly, Robert. Louis Sullivan: His Life & Work. University of Chicago Press, 1986. Excellent article. I enjoyed the words and photos very much. 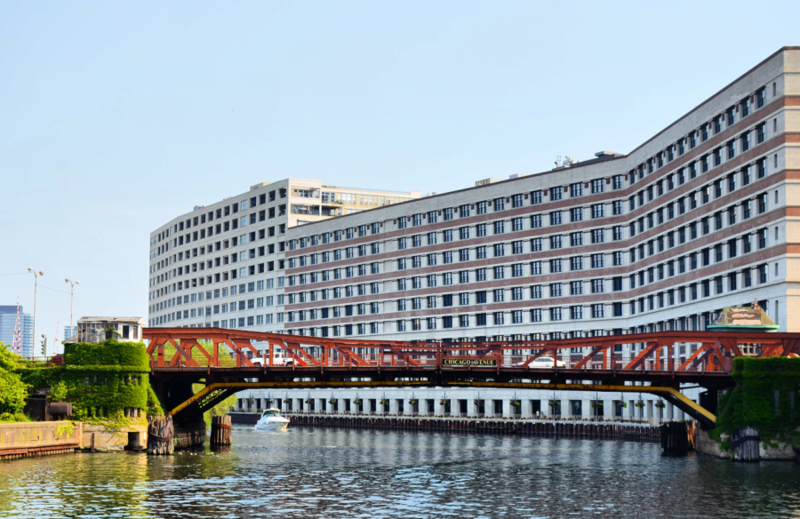 I am a Realtor in Evanston and took on this line of work because of a fascination with the Louis Sullivan, Frank Lloyd Wright and other classic architecture. Well this really is really interesting indeed.Would love to study a little a lot more of this. Great publish. Many thanks for the heads-up. This weblog was really informative and kndoeewgabll. Great work! I’ve also been looking into the claims by Wright and others on his work on Adler & Sullivan projects. In these cases Sullivan had a personal connection to the client. 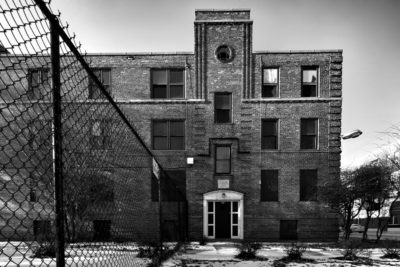 The Charnleys and Sullivan built vacation houses together in Mississippi before the Chicago house, MacHarg was a plumbing contractor on many A&S projects before the Berry-MacHarg House commission, Victor Falkenau was a builder on many A&S projects before the commission for his row houses. Plus there is the Albert Sullivan House, which was commissioned by Louis’s brother for their mother. Would an architect really turn these projects over to his assistant? Hope to see the next part of your article soon. Incredible article. Of course I am a bigger fan of the Charnley House interior which clearly reflects Sulllivan in my opinion. Looking forward to part II ! A very thought provoking piece! From much recent reading of FLW history, I would guess that the truth is somewhere between your version and that of FLW. If you haven’t read it, the chapter ‘Liebe Meister’ in Meryle Secrest’s biography is very good on F’s early influences (ie copying). Scully cited a different provenance for the design of the Oak Park Studio – though yours is perhaps more convincing. What seems to be accepted is that LS did use FLW to produce house designs in the early 90s – if you have a Wainwright or Schiller scale project on your drawing board, a house would quite possibly seem a distraction, however well you might know the client. Didn’t FLW design a couple of houses for LS himself during that period? Looking forward to the next installment! Definitely looking forward to future installments and further enlightenment presented in such a readable manner. In the absence of tangible documentation or other hard evidence, I submit that there can be no definite, final resolution of the question of “authorship.” The testimony of George Elmslie and Paul Mueller are the closest we have to contemporary evidence, and they point to FLW’s early and deep involvement in the house’s design. But the paucity of their statements creates questions of its own and does not permit a final resolution of the issue. In the end, I suspect we are left with an unsatisfactory inability to resolve the issue with certainty and we must instead satisfy ourselves informed and intelligent speculation regarding the contribution/collaboration of these masters. Freundt’s piece is a constructive and delightful addition to the literature. The focus of additional attention on this house is most appropriate. One is hard-pressed to think of many other houses that are the product of two masters of the craft. 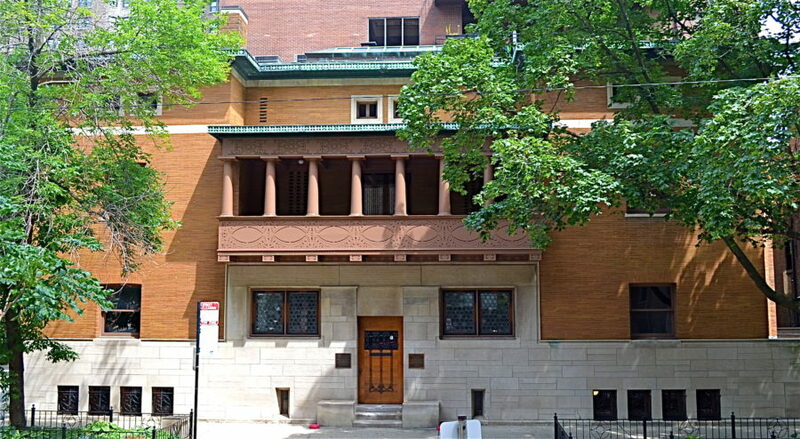 The handiwork of both Sullivan and FLW so fills this wonderful residence that, for that reason alone, the Charnley-Persky House is a treasure that brings a new delight and discovery with each visit. I excitedly await the next installment. 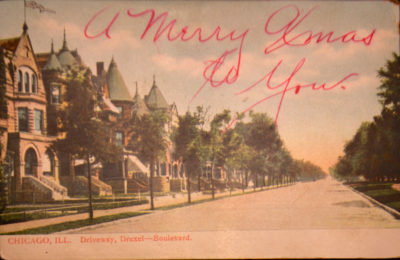 Regarding the W. S. MacHarg house…there is also a postcard view of Beacon Avenue, looking south which shows the house. Much like the known photo, a tree blocks the left (south) portion of the front facade, but the right (north) side of the house is partially visible, as is the incredibly steep roof, chimney, and at least 1 dormer window on the front of the house. The siding of the house appears much lighter than in the known photo, and had most likely been repainted. My great grandfather was Allison Wright Harlan. My grandfather, the 6th child Marcus Aurelius Harlan, and his siblings lived in the house that Frank Lloyd Wright designed and built for them. I did not actually see the house, as it burned down in the 1960’s. My father John Allison Harlan told us about it, and how the boys would use a rope or sheets to climb down from the upper balconies. Hi Laura. Thanks for sharing this. Do you (or anyone) reading this know the connection between Alison Harlan and Wright? It may have been thru the Unitarian Church that Wright’s uncle ran on the South Side. Or is the middle name Wright that somehow relates them? The three-part façade and loggia of the Charnley house is very Renaissance Italian, which other than his time spent outside of Florence, is not something typically associated with Wright. Hello Kevin. I live on Beacon and actually lived in the building that replaced the MacHarg home. I was curious if you could share the postcard view you mention or let me know where to look for it? Thanks Michael! I am familiar with that photo. I had not seen the postcard view that Kevin refers to above and that was what I was referring to.